Can Yankees GM Brian Cashman seal deal with Orioles for Manny Machado? One drawback to the Baltimore All-Star is that he’s determined to remain at shortstop. BALTIMORE — It’s not as if this hasn’t happened before. The Yankees’ renewed interest in acquiring Manny Machado, which a source confirmed Monday night, is ripped straight from the same playbook Brian Cashman used to land Giancarlo Stanton. Cashman stayed in touch early with the Marlins, then pounced when Stanton’s no-trade clause eventually made the Bronx his most appealing destination. It’s been a similar strategy with Machado. The Yankees talked with the Orioles over the winter about a possible deal and Cashman then moved to the periphery of the Machado derby. Now, in re-checking with Baltimore on Machado — as The Athletic first reported Monday — he must see an opening to potentially get something done. 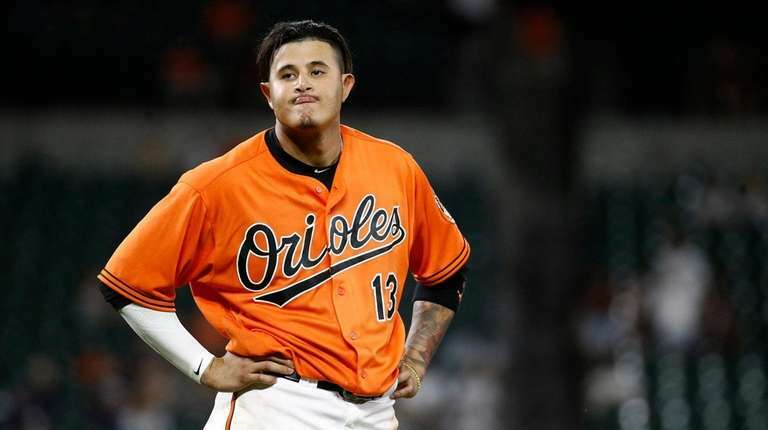 It’s unclear where the Yankees intend to use Machado, and based on his reaction after Monday’s doubleheader, the shortstop doesn’t sound as if he’s in the mood to return to third base. That would seem to create a problem for the Yankees, given that the position is occupied by Didi Gregorius and that Miguel Andujar easily could be moved off third base, either by optioning him to Triple-A Scranton or packaging him in a trade. Machado already has said he wants to play shortstop for the next team he signs with in free agency, but until then, he can’t control the process. Maybe moving from the 25-66 Orioles to the 59-30 Yankees could get him to change his mind. The key to satisfying the Orioles is the Yankees’ deep farm system, though they initially figured to use those reserves for a starting pitcher before the July 31 non-waiver trade deadline. The Yankees have the chips to beat other bidders if the Orioles put aside a long-standing aversion to doing business with them. Machado went 1-for-7 in Monday’s doubleheader — with Yankees vice president of baseball operations Tim Naehring in attendance — and is batting .309 with 21 homers, 60 RBIs and a .934 OPS. He just turned 26 — he’s only three years older than Andujar — and was elected to his fourth All-Star Game, which he will start at shortstop, the position he moved back to for his walk year with the Orioles. The Yankees have been singing the praises of their developing young stars since last season, with Hal Steinbrenner one of the biggest cheerleaders. But as much as the Yankees have benefited from having their prospects shine in the Bronx, Cashman always has recognized their value as trade chips, and pursuing Machado is just another example of maximizing those resources. Adding another righthanded power bat may seem excessive for a team that employs Stanton, Andujar, Aaron Judge, Gary Sanchez and Gleyber Torres, a group that has the Yankees on pace to break the single-season home run record. But the same was said about Stanton being a luxury for the Yankees — right up until Cashman put the final touches on the deal. Despite Cashman’s public lobbying of his crosstown rival, the Mets have shown no inclination to trade Jacob deGrom or Noah Syndergaard, especially to the Yankees. The Blue Jays’ J.A. Happ and the Rangers’ Cole Hamels were rocked over the weekend, and the market doesn’t have a Justin Verlander this year. The absence of that difference-maker is what may have pushed Cashman to consider alternative ways of upgrading his team.